People like me, people who have a long string of hobbies that would take up several lifetimes, and a list of interests that extends even further than that, end up cycling through things, returning to favorites, and constantly adding a few more cool things to the list. That way the list gets longer and longer. I haven’t been paying much attention to this blog lately, but that’s because I’ve been playing the piano, drawing pictures, exploring some different social media sites, and trying to keep a steady eye on fitness levels and all the physical recreation that I like to do as well. Lately, I’ve added a new thing to my list of hobbies. Cycling. I got excited about riding the road bike that my friend, Beth, gave me last year, and over the course of this very dry winter, Tom and I bought mountain bikes. As it turns out, although perhaps every boy rides a bike this way, there are some fundamental bike riding skills, that I never managed to pick up in my girlhood, and I’ve been getting an education riding around the trails behind our house. Plus, I’ve been invited on a bakery to bakery bike tour this spring, and I’ve been trying to get into shape enough to enjoy, or at least survive, the ride. I’m unused to spending much time in the saddle, but am trying to remedy that. My friend Chris, made the following video with a new GoPro, and although I wasn’t with him on this ride, we’ve done a few loops of the Valley together. It’s a great way to get out and “get the news” as John Muir would say. Biking Southside Drive from Chris Publiski on Vimeo. I wish I had stopped to take a picture. Really. But sometimes, you’re having so much fun doing what you’re doing, that you just don’t want to stop and dig the camera out… even if you had it stashed in a convenient pocket to do just that. The Cross Country Center at Badger pass opened this weekend, and Tom and I wandered up to see what the skiing was like. The previous storm dropped about 12 inches, meaning that the road had a decent coverage, but there wasn’t enough on the hill for the lift-served area to open. In some ways that was fine with me. I was excited to get a nice aerobic workout in. The connector trail from the parking lot to the road wasn’t groomed, so we put our striding skis on, but then turned back when we realized that the road itself was freshly groomed, and changed to our skate skis. With all of the fresh snow, the skating was slow enough that we skated most of the downhills, but firm enough to be fun. We went out past the Bridalveil Creek bridge and up to just before the next section where it starts downhill again. I was feeling surprisingly tired from the P90X workouts I’ve been doing lately, and decided that was a good place to turn around. Tom went a little further and then caught me on the long climb back up to Summit Meadow. I’m looking forward to more of that! We had just pulled out of the Badger Pass parking area, and were getting ready to make the left turn onto Badger Pass road when we caught sight of a green Subaru driving entirely too fast for the conditions. Sure enough, although the driver turned the wheel, his car kept going straight, careening wide into our lane. Fortunately, Tom managed to slow down just enough and the Subaru smacked hard into the snow bank just in front of us. I suppose it’s a no-harm-no-foul sort of situation. We backed up to give him space to back out of the snow bank and he pulled himself clear, wheels spinning and sliding across the ice. I thought at one point he was going to hit us after all and Tom muttered that someone needed to learn to drive in the snow. Naturally, the guy was very apologetic. He hadn’t had any other issues with handling on the way up, and was surprised to lose control so spectacularly and completely. That’s the second time we’ve almost been hit at that intersection. The first time was also due to someone trying to take that corner way too fast. That car had chains on the front wheels, and as the front end of the car turned the corner, the back side whipped around into our lane, pulling the rest of the car with it. It’s a tough corner. During the summer, as you’re driving up, Glacier Point Road actually takes a slight left bend there, and it looks like a hard right turn into the Badger Pass parking lot – the kind of turn you’d want to slow down for. In the winter, the road beyond the parking area isn’t plowed, and if you aren’t paying attention, it might look like just another right turn in the road. And if you aren’t paying attention, you might not realize how steep the turn is. And if you aren’t paying attention, you might not notice that as you continue up the Badger Pass road, it gets more snowy and more icy as you gain elevation. My point is – pay attention. I love running into friends at Badger Pass, but not like that. I love Twitter. I’m not on it all the time, but sometimes it’s amazing the cool things you read and discover there. This came from YosemiteSteve, the talented creator of the Yosemite Nature Notes films who apparently has a Grizzly bear project kicking around his mind. I’m hopeful that we’ll all get to benefit from that eventually, but for now, I was just interested in the story of what might have been the last grizzly killed in Yosemite, back in 1887. Steve posted a link to the original hand-written letter from RJ Wellman to Joseph Grinnel, and the rough transcription that I made of it is below. – Although Wellman has a great deal of respect and admiration for the grizzly, his thoughts about wolves and cats aren’t nearly so generous. – Two guys milled a tree, packed the lumber on a mule and built a scaffold 10 feet off the ground in one day, and I wonder what kind of tools they were using. – The letter written on April 20, 1918, was finally received June 19. I wonder if they thought a two-month transit time was fast or frustrating. I tried to preserve the spellings where I could make out the letters, and things I couldn’t figure out are noted with [brackets]. I could probably have figured out more, but was more interested in the spirit of the story, which I think comes through clearly regardless. The Mono Winds are blowing in Yosemite. My Facebook stream echoes with wide-eyed descriptions of the fierceness of the wind shaking the buildings, but in the newer construction over by Curry Village, it’s a regular night in the apartment, tapping away at my computer and learning new things. Oh, yawn. It’s best to be prepared, so the executive team met to discuss possible emergency measures. They are taking the situation seriously. A tree fell down early in the day near where I live in Curry Village. Certain evening programs were cancelled as people were encouraged to stay indoors, and some residents were asked to prepare in case they needed to be evacuated quickly – if a tree fell and hit their building, for example. I called Tom and suggested that he move the car to an open area out from under any trees. The climate around me started to feel a little jumpy. People were trying to figure out what they were going to do with their pets, where they would go etc., and when it came time for me to leave for the evening, the prospect of walking alone in the dark for a mile back to my apartment was starting to make me nervous. Thank goodness for cell phones. I called Tom and made idle chit chat as I walked, figuring that if the freak accident did occur, at least he would know to call 911 quickly, and I chose a route home that avoided overhanging trees as much as possible. I think that walk home felt like being a mouse for a few minutes – like something big might come crashing down on you at any moment. Best to be alert, and just this side of paranoid. Other than being blustery, it was a beautiful night, crunching my way through all the leaves and pine needles that covered the walkways and roads, but it was hard to enjoy it. All in all, I’ll be happy when it is over. Hopefully we’ll all enjoy a peaceful and uneventful night. This bear explored the trap from every angle, trying to get inside. With a husband starting work as an Interp Ranger, it’s easier than ever to geek out on Yosemite nature trivia. Our latest adventure in obscure (?) Yosemite flora, was a trip out to visit some knobcone pines, combined with a trip to the old sugar pines in the Rockefeller grove. 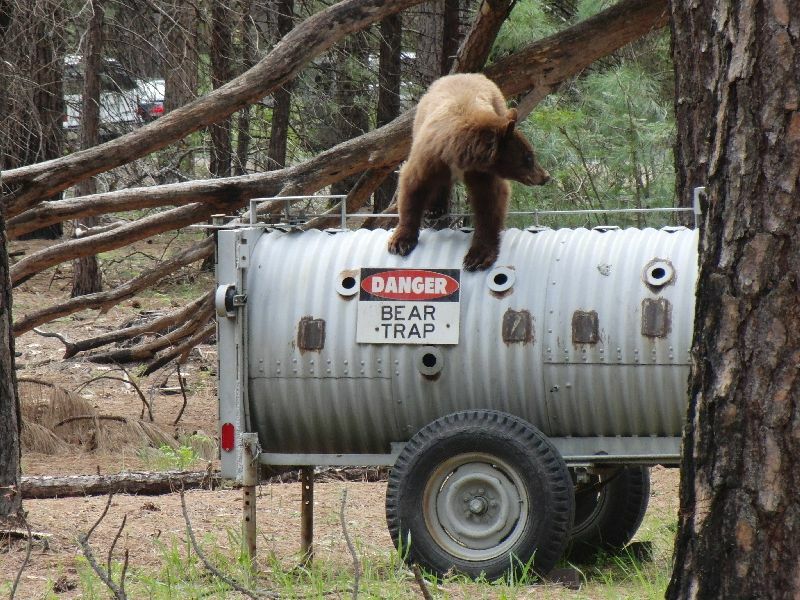 On the way through Yosemite Valley to look for them, we stopped to watch a young bear exploring a bear trap. If the door hadn’t been locked closed, I’m sure NPS would have itself a trapped bear, because this bear was trying as hard as it could to find a way in. It sniffed at all the openings, tugged on the door, swiped several times at the padlock in the back, and climbed all around and under that trap. Bears are so cool. As usual, whenever there is a bear close to the road, a huge crowd gathers, and it was disconcerting how comfortable this bear seemed to be in spite of all the people around. Unfortunately, it’s precisely this bear’s comfort with people that is likely to get it in trouble. A little bit of fear, judiciously placed, can keep bears out of the wrong situations. Hopefully, it won’t end up as a sad bear story over on JeffreyTrust.com. It’s always a treat to see an untagged bear – even if it is probably on its way to earning a tag. Still, the highlight of the trip was the visit to the knobcone pines. We learned that there was a bunch of them growing along the road down into Foresta from Hwy 120, and since they’re relatively rare, decided that it was worth a trip to see if we could find them. There are plenty of great animals that don’t get their proper attention because of how common they are – like robins, which are really great birds – but there is something special about going to a place to see something that you can’t just see anywhere. Plus, these trees have some really cool and interesting biology. Instead of dangling its cones out on the ends of a branch like most pines, the knobcone pine shelters them in around the stem and trunk in small clusters, and is reluctant to give them up. 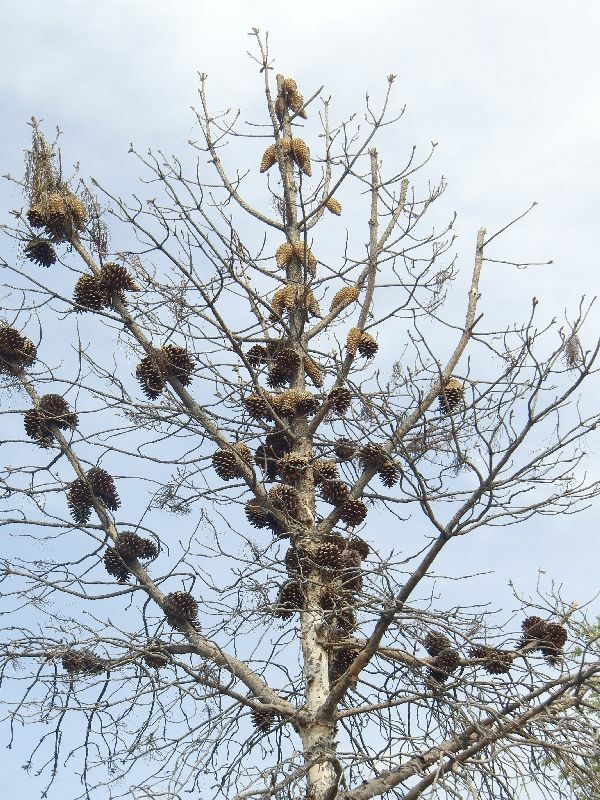 Sometimes the trees hold onto the pine cones for so long that the tree actually grows around the cones, swallowing the still viable cones into the growing trunk. Did you catch that? So if you cut down one of these trees and found one of these cones embedded in the wood like an insect in amber, you could still extract the seeds, plant them, and watch them grow. Nature is amazing. If you look carefully, above the open and blackened pine cones, you can see the still unopened cones waiting for the next fire. 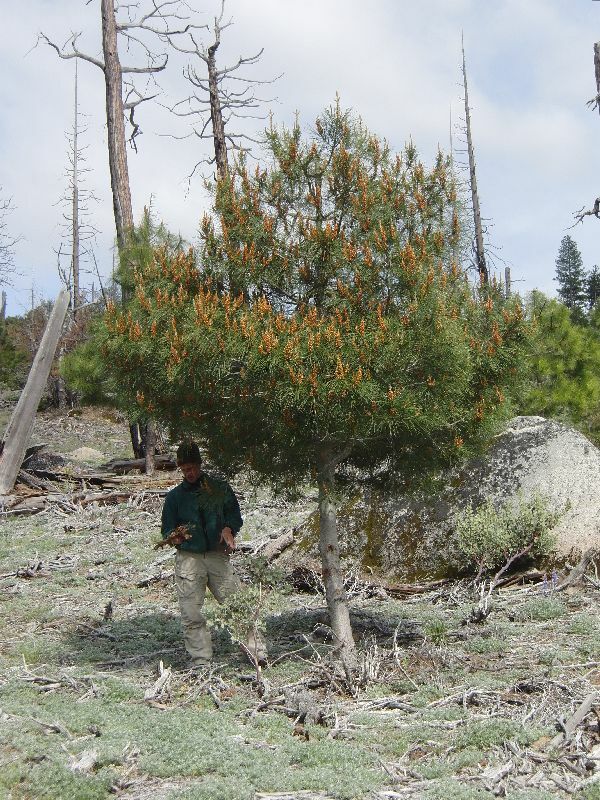 Like the giant sequoias, the knobcone pines are dependent on fire to reproduce. The heat from a fire triggers the cones to open up and release the seeds onto the ground where the fire has also prepared the soil to give them the best chance at growing. Because of the Big Meadow Fire in 2009, many of the knobcone pines in the Foresta area released their seeds and the young saplings are off and growing. With the needles gone, it’s easy to spot the previous generation of knobcone pines, with the open, blackened cones still hanging off the trunks like some strange growth. What’s interesting is that you can see how high the fire reached on each tree by looking at which cones opened and which did not. Many of the burnt knobcone pines still have what look like perfectly viable cones high on their branches. Maybe they’re waiting for another fire? Now that we know what to look for, maybe we’ll start seeing knobcones all over the park. According to Yosemite Naturalist extraordinaire, Pete Devine, there are some in the Rockefeller Grove, and the Sierra Nevada Tree Identifier says there are supposed to be some on Hwy 140 above the Arch Rock Entrance Station. But the ones that we saw were on the Foresta Road, right after the first sharp right turn as you head down from Hwy 120. The burnt out tree skeletons give you the first sign that you should stop the car, climb out and start looking around. We also finally got around to exploring the Rockefeller Grove. This area is supposed to be known for the old sugar pines that were saved from logging back in 1939 when the Rockefeller Foundation matched contributions to set it aside as part of the park. We didn’t notice the knobcone pines there, but we didn’t know what to look for yet. Sugar pines have a special place in our hearts. There are two ~80 year old sugar pines on our small chunk of land in Yosemite West. The fact that they drip pine sap and occasionally pine cone bombs onto everything we own, is offset by the fact that they seem to attract Chickarees to our property, and I love watching those little squirrels. Plus, sugar pines are Pinus lambertiana, aka the Lambert pine, so really, they are like family. Having seen an enormous but unheralded sugar pine on the ski from the transfer station to the Mariposa Grove, I had visions in my mind of similar-sized trees clustered in huge numbers at the Rockefeller Grove. Not so. 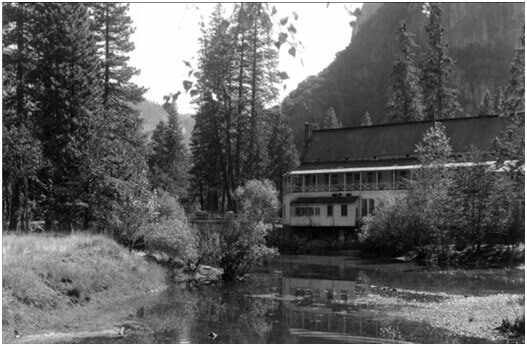 The Sentinel Hotel was located right on the bank of the Merced River and used to release its sewage directly into the river. Ew! One of the things I learned that was that the Sentinel Hotel used to be located right at the edge of the Merced River and dumped its sewage directly into the water. According to Sue Beatty, this is why the campers all moved upstream of the hotel, and ultimately one of the reasons that so many of the current campgrounds are located at the west end of the valley. It must have been a delightful place to stay – right there on the edge of the water, with exquisite views all around. I’m sure many people were attached to that place, had met their friends there countless times and developed cherished memories of that place. Today everyone can see that long term (heck, even short term for the people that wanted to get their drinking water further down the river) this was not an appropriate use of the river. However, I wonder if back then, some little girl cried when she found out this old building wasn’t there anymore. 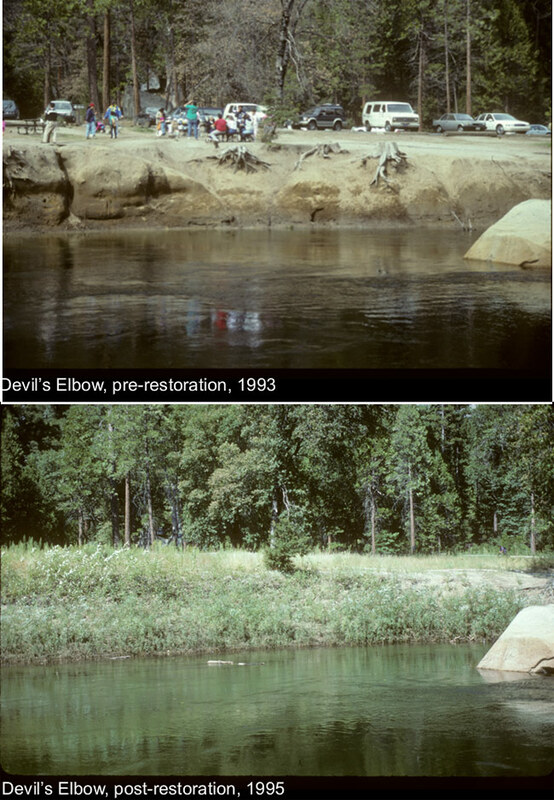 One of the more striking before and after images, for me, was of Devil’s Elbow in 1993 vs 1995. You wouldn’t think that two years could make such a dramatic difference, but restoration crews and planners managed to turn a tired, trampled picnic area back into a place of natural beauty. It’s almost hard to believe that this is the same location until you notice the boulder in the river in both pictures. Now, I’m told that willows, a sign of healthy riparian ecosystems have also returned to the area. Hoorah! We can make a difference. 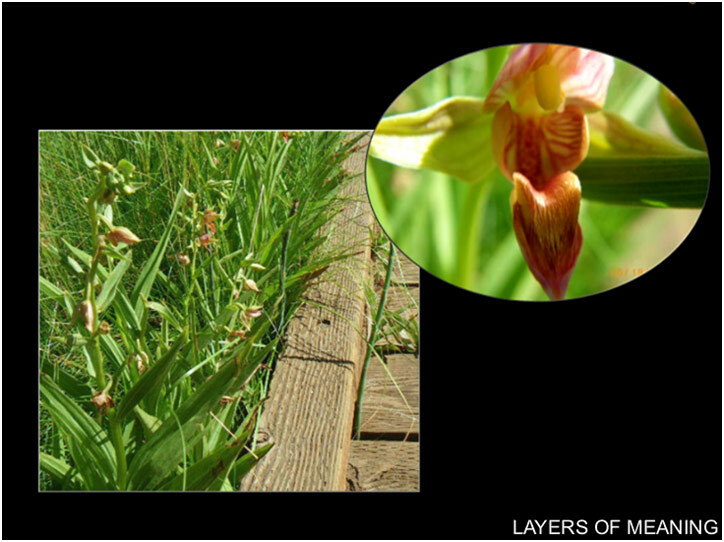 A rare orchid was seen growing next to a boardwalk in a once trampled meadow. A few commented on that sentiment after seeing an image of a rare orchid growing next to a boardwalk in a once trampled meadow later in the presentation. The decisions and sacrifices that we make now – using the boardwalk instead of wandering the meadow itself – can have other rewards down the line. Yesterday I did something that I rarely make the time to do – I went to one of the Evening Programs put on by either NPS or DNC Interpretation. After a long day at work, it can be hard to motivate for anything other than a relaxing evening at home. However, this program was being given by film-maker, Steve Bumgardner, on the making of Yosemite Nature Notes which I love. Plus Tom planned to spend the evening at a YWPHI meeting, so I thought I’d check it out. I’m glad I did. I’ve seen most of the Yosemite Nature Notes videos before, especially the most recent ones, but even I saw some new stuff, like the the previews of episodes to come, and enjoyed listening to Steve’s take on the park, on filming in the park, and sharing Yosemite’s magic with people. I suppose it isn’t that surprising that a guy who makes his living telling stories on film, can put together a fun series of stories in person too. We got to watch three of the finished YNNs, starting with the most recent video on Horsetail Falls, the Glaciers Episode, and then the Big Trees Episode which narrowly won out over the very popular Frazil Ice video as the parting shot. Plus, a couple of shorter pieces – some ‘making of’ shots, and a timelapse of Yosemite’s crowded spots which drew out-loud giggles from the crowd in many places. During the making of sequences, Steve talks on camera about how difficult it is for people to get to remote corners of the park, like Mt. McClure and Mt Lyell where the glaciers still live, and the pleasure of being able to share some part of that experience with people via camera. I hadn’t thought of these films in quite that way before, but it’s true. I’ve been asked if there’s enough to do in Yosemite for 3 days, and these films are the start to a visual answer to that question. If I think about all the things that make Yosemite special, the ideas for film topics goes on and on. I’m looking forward to the upcoming Moonbow episode, and whatever comes of the backcountry ski/backcountry hut footage. What about the High Sierra Camps? Big Time? Climbers and Big Wall climbing? Each person who has spent time in Yosemite has this running list of things in their mind of what makes this place so special. There are rafters, and hikers, and painters, and people that hang a hammock out by the river and spend all day with a good book. What kinds of things do they think are amazing? What else belongs on that list? Two weeks ago, Tom and took a leisurely walk through Cook’s Meadow and noticed that the Redwing Blackbirds had returned for the spring season. 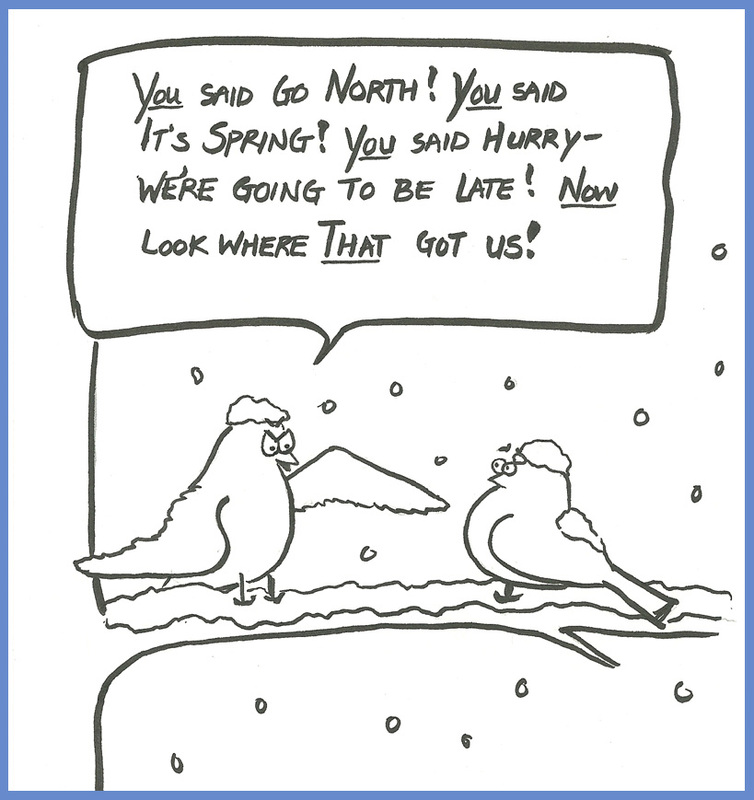 It’s warm and sunny again, but after the intervening storm, I got to thinking about those optimistic birds, and what they made of the intemperate weather. Finally got around to drawing it out. Actually, the warm temperature has created trouble of its own for us. All the melting snow is slowly puddling up on our property, and Tom spent the day digging a drainage trench and carrying buckets of water out of our crawl space. Fortunately, DNC facilities let me borrow a sump pump so that we’re not going to have to do that in shifts throughout the night! Tomorrow’s forecast for warm rain over all that snow uphill of us still has us biting our nails, but it’s going to be ever so much better with that pump! In a certain twist of irony, as we battle too much water in the crawlspace, we’re also dealing with no water in the tap. The county guys have been here for a couple of days and with all the snow and melting they can’t even find the source of the leak, much less work on repairing it. The water has been out for about a week now, and the county has decided to save money by not having their crews work through the weekend. We’ll be fine, of course. It’s like camping, with the bonus of heat and electricity, but after the big storm, lots of us are ready for a return to normal, and of course the renters that had planned to stay this weekend weren’t very excited about the lack of water. We found them a place to stay in El Portal, at Yosemite View Lodge, so they’ll be fine, but we’re sad to see them go. 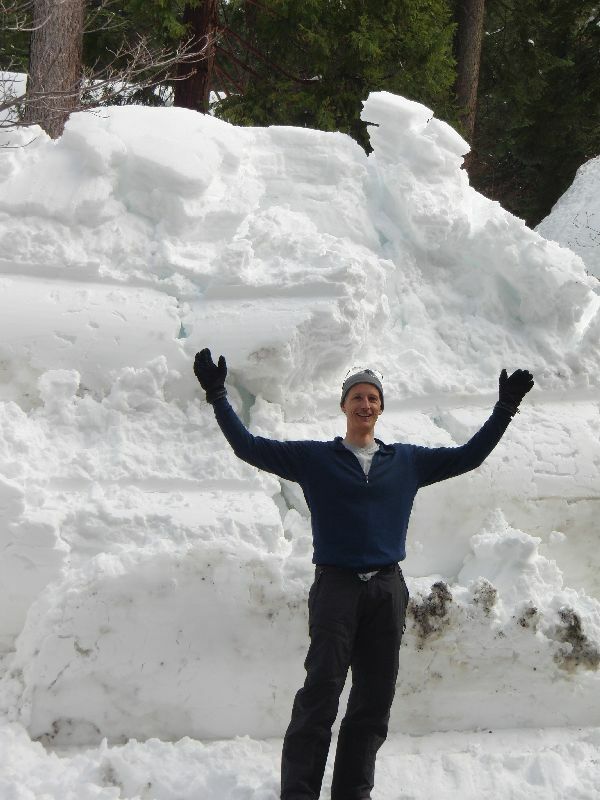 Even old-timers in Yosemite hadn’t seen so much snow in 30 years. The storms started the weekend of March 19, and kept going through 11-15 feet. That’s right. Feet. Of. Snow. Roads closed as trees and rocks fell across the road, and plows failed to keep up with the snow. Power lines were also hit, knocking out power across the region – leaving people without lights, and without heat. On top of that, in our neighborhood of Yosemite West, our archaic water system sprung a leak, cutting off our water supply. For one night both the generator for communications and the battery back-up to that generator failed leaving residents deprived also of phone contact. Tom and I missed most of the drama. Returning from a wonderful weekend in Bishop visiting a friend, we saw no need to wait for the convoy and fight our way INTO that situation when we had wonderful welcoming friends who were willing to host us for a few days. While friends dealt with 42 degree INDOOR temps, no hot showers, and the like, we were taking walks in the central valley sun, having dinner with friends, watching movies IN THE MOVIE THEATER – a rarity for us, and telecommuting happily from our computers, showering, doing laundry and enjoying central heat. The thing that is really great about situations like this one is the way people come together and take care of each other. We had some renters staying in our house that first weekend, and are so grateful to all of the neighbors that pitched in to help make sure they were doing OK – raiding our upstairs apartment for non-cordless telephones that would work without power for them, shoveling and plowing, checking in, and helping to share information. (It helped that we had really cool renters too.) You can feel the community pulling together. When we finally did return to the park on Sunday, we were greeted by many neighbors as we made our way down the single plowed lane to our house. 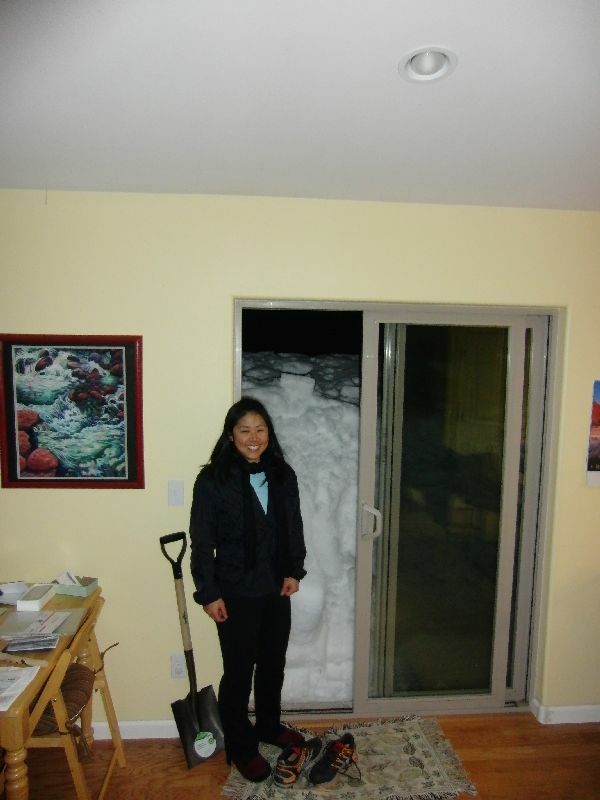 One neighbor who’d stayed through the entire ordeal, and had been doing daily shoveling duty wandered down to our house with his shovel over his shoulder to help us dig out. Another neighbor with a bobcat plowed through the 10-11 foot berm in front of our driveway and created a spot for us to park, a third neighbor took some extra time with a plow to clear our street, and widen the mouth of the parking spot, and a forth neighbor, having finished his driveway drove down later to make sure we were doing OK. How could we not be OK with awesome neighbors like that? Our planned trip to the East Side to visit a friend in Bishop was a catalyst for being on the outside of a whole bunch of crazy that has been going on in Yosemite. The stay in Bishop was wonderful. Ahough we didn’t get in as much skiing as we had anticipated, we enjoyed hanging out and being out of the valley.